The Bourne Ultimatum! I’ve always had a sneaking respect for Matt Damon; not one of Hollywood’s obvious leading men, he’s not part of the scene and lives quietly with his family in Miami. But he gives the highest ROI of any star, and he was perfect for what’s become his signature role – not flashy, not great looking, a bit dull really. In other words, a believable character. And the film’s a rollicking two hours amidst the wreckage of duff blockbusters this summer: I yawned through ‘Spider-Man 3’, ‘Die Hard 4’, and ‘Transformers’. No yawning in Bourne country, at least. But it’s a flawed film, not up to the excellent previous episodes. For a start, the handheld camera stuff near the beginning is a bit selfconscious – ‘I’m doing it ‘cos that’s what you do in a Jason Bourne film’. It works to convey the fog and confusion of chase scenes, but why use it in extreme close-up while two characters are just calmly talking? And the perfunctory scene where Bourne hits an Internet Cafe, channeling the great ‘Hotel Brecker online search’ in Bourne 2 – it lasts just a second or two, almost an afterthought just to get the motif in. The film also suffers from the same paranoia as ‘Die Hard 4’: thinking that just because it’s powerful and well funded and unaccountable, a secret government agency can snoop and snitch on anyone, no hiding, no getting away. And if the agency wanting CCTV footage really is secret, then think of the average guy working the security detail at Waterloo – what would he REALLY do if an obnoxious American from an agency he’s never heard of phoned in demanding a live uplink of every video feed within a km? 98% of CCTV cameras aren’t linked to anything but the screens in the operator’s room; that’s the CC part. There’s also an uneasy connection between Cold War iconography – false passports, papers stamped TOP SECRET – and sophisticated spy technology. Why, if they can tap into a satellite uplink in Tangiers, do they keep lots of vital documents printed out on paper in a safe in the boss’s office? There’s nothing so insecure as plain paper. And this whole notion that a government agency is able to move fast enough, mobilise strongly enough, and have motivated enough leadership to react within minutes to a single codeword picked out from an Echelon-style listening system. If you wanted to do that, you wouldn’t choose an easily-confused word like ‘Blackbriar’ for your black ops programmes – especially when most of the film is set in London. (If you had a mission to shoot everyone who mentions a word sounding like that, you’d have carnage at a certain City of London train station every rushhour…) The film suffers from a common misconception of universal surveillance: that the authorities have the ability to sort out signal from noise. It’s also got the same thing I recently found annoying in Fantastic Four 2: the apparent worldwide hall pass enjoyed by US agents that lets them carry guns, tap into phone calls and CCTV footage, and bump off random strangers anywhere without fear of consequences. Look, Blair may have tried to make Britain a poodle, but we’re not THAT cringing. In addition – as has been aptly demonstrated in recent times – the CIA is, in reality, a bit crap. From the Bay of Pigs to Vietnam to Iraq and Afghanistan – not a SINGLE agent on the ground as the Taliban rose? Power-crazed perhaps, dangerous certainly, but the efficient, honed machine portrayed in the film? Definitely not. But these are niggles. All the other motifs of Jason’s reality-TV action style are well used. There’s a full second of looking around, thinking, making decisions before taking action. 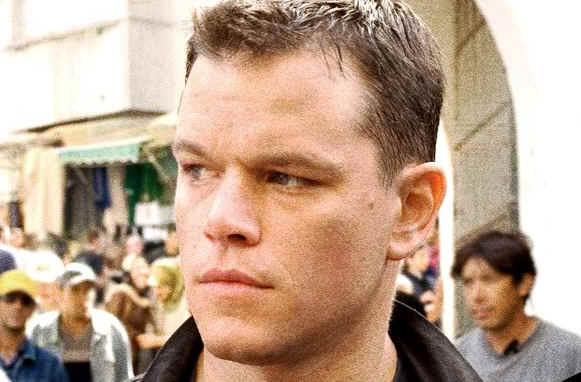 Urban scenery, from buses to bystanders, become weapons in the Bourne idiom. The setpieces are great, all the better for being familiar everyday locations (in the Bourne mould) rather than Bondian highlife of casinos and superyachts. The Waterloo sequence – a mere hundred metres to be traversed, with CCTV cameras given elegant menace and crowds used as cover – is terrific. The best part, though, is where we realise with a jolt that one scene isn’t a flashback: the first half of the film happens, chronologically, before the end of the second. Brilliantly done. (I believe the scene was actually written by Matt Damon himself.) The scene works because it fills in a minor gap in the previous film – how Bourne knew Pam Landy would be in her office, at that address. Also, we end the series where we came in: with Bourne floating in open water, near-dead. But this time – he pulls himself up. A cute metaphor. And perhaps there’s one more film in this franchise. We still don’t know who David Webb really was, or why he made the decision to get his brain washed; and there are a LOT of unanswered questions about the icy Nicky. Since the films are totally different to the books anyway, the studio doesn’t owe anything to Robert Ludlum; let’s have one final Bourne, and learn where the man came from.